ZOMEWORKS: the leader in passive solar energy trackers since 1969. 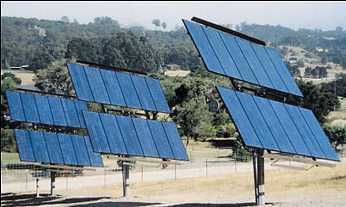 The Universal Series Track Rack is the latest in a long line of Zomeworks photovoltaic mounting structures. Since 1980, over 12,000 Zomeworks tracking systems have been installed in different climates on nearly every continent on Earth. As dependable as gravity and as reliable as the sun's heat, more than 99% of these trackers are still in operation today! To jump to the pricing and specifications page, click here. The UTR starts out the day facing west -- from the evening before. As the sun rises in the east, it heats the unshaded west-side canister on the tracker, forcing liquid into the shaded east-side canister. As liquid moves through the copper tube to the east-side canister, the tracker's balance changes, and rotates so that it faces to the east. The heating of the liquid (refrigerant) within the tracker is controlled by the aluminum shadow plates located like "wings" on the outside edges of the tracker. When one canister is exposed to the sun more than another, the result is its vapor pressure increases, forcing liquid to the cooler, shaded side of the tracker. The shifting weight of the liquid causes the rack to rotate until the canisters are equally shaded. This is what keeps the tracker focused on the sun, as it tries to maintain keeping the canisters as equal as possible. As the sun moves across the blue sunny sky, the rack follows (at approximately 15 degrees per hour), continually seeking equilibrium as liquid moves from one side of the tracker to the other to keep it facing the direct rays of the sun. The tracker completes its daily cycle facing west. It remains in this position overnight, until it is awakened by the heat of the rising sun the following morning. There are five standard sizes of Zomeworks trackers, holding from 2 to 16 modules. Every Universal Track Rack will accommodate most PV modules on the market. If you have modules not listed as "regulars", call us-- Zomeworks will build to your specifications. These trackers come packaged as a kit with all the hardware and instructions for quick and sturdy assembly. Because just five basic sizes cover most entire range of needs, Zomeworks and its distributors are able to supply trackers with short lead times (at this point---unless we have another Y2K!). EFFICIENCY: in summer in most climates, utilizing a Zomeworks tracker will increase your modules' efficiency by 35% to 40%; in winter ,as much as 15% to 20%--but much less in winter if you're in the north or in a cloudy climate. Typically trackers are used in water pumping systems, as water is generally in greater demand in summer over winter. It may be more cost-effective to add more modules for low-light winter conditions, as opposed to utilizing a tracker. It depends what your loads are seasonally. These new trackers incorporate several decades of experience and design, featuring an early morning 'rapid return system'; it's shipped partially assembled and is easy to install and module specific. CONSTRUCTION: these tough units are built of milled steel and are finished in satin black urethane paint. Stainless steel mounting hardware is provided with all Track Rack systems. These are designed to slip over SCH 40 steel pipe masts set in concrete, and are locked tight by tightening a bolt. Very simple and effective! The Track Racks' damping pistons are specially modified automobile shock absorbers, which are inexpensive and easy to replace if necessary. These are built to withstand 90 mph winds. Also, these mounts offer a north-south axis adjustment of 2, 15, 30 and 45 degree for optimal seasonal performance. Most users adjust their Track Racks twice a year. The Track Rack liquid-gravity drive system utilizes R22 HCFC refrigerant in a rigid, completely sealed system. All joins are silver-soldered and there are no parts to flex or bend. There are no threaded fittings, plastic hoses, or high-tolerance seals. E-mail us for your freight costs on these.